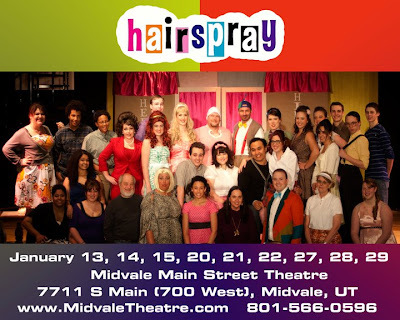 Have you seen "Hairspray" yet at Midvale Main Street Theatre? You need to. One of my besties, Leah Jacobs, plays MotorMouth Maybelle, and I have never seen her perform at a higher level. I'm not saying this because I love her and love the way she does my hair (true story! ), but because she is phenomenally talented. The audience roared for her, even mid-song...they all loved her too! She brought down the house. Not only is Leah every theater's dream-come-true, the entire cast exceeded my every expectation. 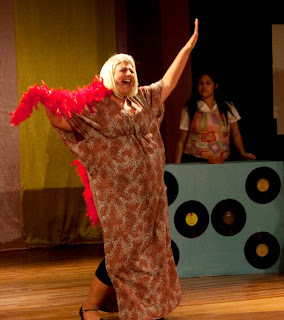 Kat Stoutsenberger is sparkling as Tracy Turnblad, a role she was born to play. You will be unable to stop yourself from smiling every time she busts a move, which is when her character truly shines. Her understudy played Little Inez the night I went, and...wow...Taylor Lawrence...what a voice! Russ McBride is a king of improv and had me busting a gut with his Edna Turnblad alongside Wilbur, Eric McGraw. And I can't forget Cassidy Ross as the endearingly annoying Penny. You do, however, have to keep in mind that this is Utah, and we do lack in the category of non-caucasian performers. One of the local news stations did an adorable segment on them. I've seen many of them perform before and I have never seen them perform better than in this show. If you enjoy the musical or movie, "Hairspray," at all, you need to go see them before January 29 (details on the photo)! The intimate venue adds to the experience. You won't regret it. If you want to go, I'll come with you! Buy tickets here. Looks like the local theater "reviewer" agrees with me too! Read the review here.